I read earlier (eight years ago!) 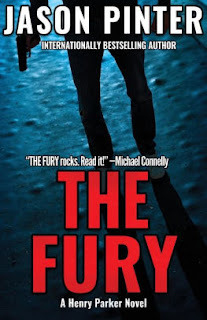 a pleasant paperback novel by Jason Pinter, The Mark, and wanting to read something lightweight I picked up his later novel, Fury (Raivo in Finnish translation). I thought it was better book than The Mark, but I also have some reservations about it. Fury is a fast-paced thriller with hardboiled overtones and with sensible amounts of grimness. It's an old-fashioned book, reminiscent of early wrong man novels and films and some classic newspaper stories, though Pinter has tried to bring his heroes into modern day, sometimes with a bit forced results. There are some implausibilities in the book (why won't the stranger say he's Parker's brother in the first place? ), and some characters are a bit lifeless. There are some very talkative scenes, but still this is an entertaining book. This is no Forgotten Book, but here's nevertheless a link to the on-going series of blog posts.